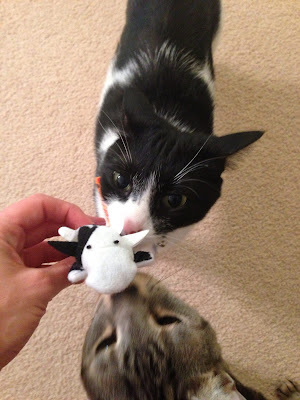 Your Daily Cute: Two Cats Tuesday: Pimp and Moo's New Cow Toy! Oh Pimp, you're just too cute with your little toy! Catnip and Valerian? Now that's interesting.....Catnip to pump you up mixed with Valerian to calm you down....hmmmm...maybe that's why Moo was left flat. I've never heard of using Valerian in toys. What does it do? As usual, just love the pics of Pimp and Moo. 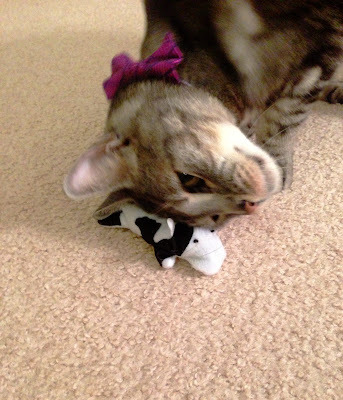 The one of Pimp with his head on the cow is adorable. 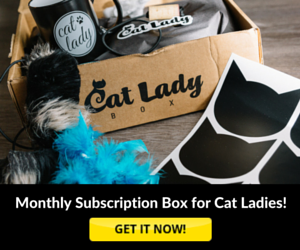 Cats like Valerian? Who knew? 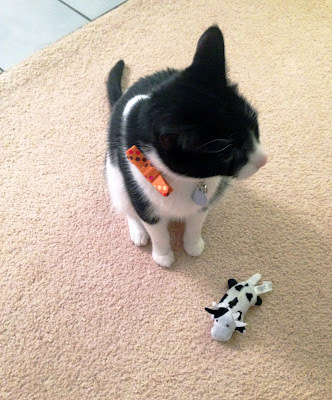 Pimp and Moo are so cutting edge!!! Happy Tuesday! Yes! It's like super catnip apparently! It is like super catnip. They like it. Google "plague rats" cat toys. They are all valerian! We have two and they love it! I will have to see if there is a goat. Well what do you know! The publicist says that as soon as her paypal has some $$$ she will get the goat for the Farm cats. I'm not sure what I think about this. Cool toy! We really need to try some of that stuff one of these days..
WOW! Never knew a cat would like valerian. I grow catnip in the yard for them. I shall have to discover whether they like valerian as well. How sweet is Pimp using the cow toy as a pillow - just like a catnip pillow. Valerian! How unusual - never heard of that before but if it has a calming effect it would be great for my fosters if company is coming. Would like them to be used to people but not really a lot of people here. Great news to know. Have fun Pimp you sweetheart, and Moo you'll just have to stick with catnip or maybe honeysuckle would suit you better? Ever try it? It's nice too.